On Tuesday, the Environmental Protection Agency kicked of its one and only hearing on repealing the Clean Power Plan. The two day affair is intended to give Scott Pruitt’s EPA a veneer of having listened to the people, before it goes ahead and does industry’s bidding. The hearing is taking place in Charleston, WV, a symbolic shout out to the Trump administration’s love of “clean, beautiful coal.” There are 216 people scheduled to speak, including a number opposed to repealing the Clean Power Plan. But let’s not kid ourselves. There’s no reason to think Scott Pruitt will care about a single word uttered at the hearing of those opposing his efforts. There’s every reason to think that he would love to wear the “I survived the war on coal” hat that the head of the West Virginia Coal Association’s offered to send him while signing off on his repeal plan. This is the road Scott Pruitt has been walking down for years, starting from when he was Oklahoma’s attorney general. 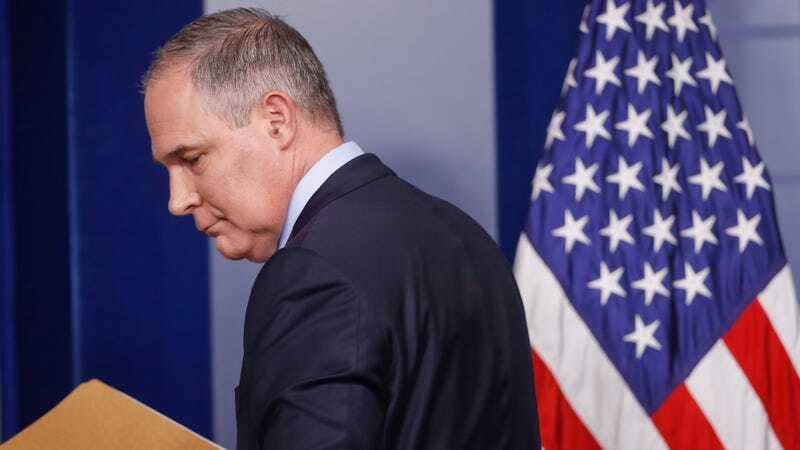 During that period, he copy and pasted energy industry talking points onto official Oklahoma state letterhead, and sued the EPA to stop the Clean Power Plan, the centerpiece of former President Obama’s climate change legacy, from going into effect. He raised nearly $353,000 for his election campaigns (included a failed lieutenant governor bid) from the energy and natural resources industries. Since his confirmation to head the EPA, he’s denied that carbon pollution is the primary cause climate change, killed the EPA’s climate change website and stocked its science advisory board with industry shills, including people who deny the negative impacts of air pollution on health. Pruitt’s whole purpose in his tenure at the EPA has been to eviscerate regulations, and climate regulations have been enemy number one from day one. Pruitt has also hidden from public scrutiny, constructed a sound-proof chamber in his office, and refused to release his daily schedule. The copies journalists have obtained through the Freedom of Information Act show the administrator spends a lot of time with representatives from the industries he’s supposed to regulating. Like Murray Energy chief Bob Murray, who also kicked $300,000 to Trump’s inauguration, and will spoke at Tuesday’s Clean Power Plan hearing in favor of repeal. Even the hearing’s premise is a give away that this isn’t about listening, it’s about posturing. “The EPA is headed to the heart of coal country to hear from those most impacted by the CPP and get their comments on the proposed Repeal Rule,” Pruitt said in a press release announcing the hearing. First of all, West Virginia is the coal country of Pruitt and the Trump administration’s imagination. Sure, West Virginia was coal country at one point, but now Wyoming produces nearly four times more coal than West Virginia thanks largely to automation. That same automation is putting more miners out of jobs than the Clean Power Plan (to say nothing of the switch to natural gas). Attempting to tie the Clean Power Plan to disappearing mining jobs is disingenuous at best. And it could very well slow the transition to a more diversified economy by providing false hope that coal is coming back. If the EPA was really interested in hearing what people impacted by the plan think, they’d go to communities near power plants. The health co-benefits of the Clean Power Plan alone are worth an estimated $14-34 billion. Implementing the rule would prevent 3,600 premature deaths, 1,700 heart attacks, 90,000 asthma attacks and 300,000 missed workdays and schooldays annually, according to the EPA’s own analysis. Yet there are no hearings scheduled in even one of those communities, which tend to be overwhelming poor and home to people of color. According to the NAACP, three out of four African Americans live within 30 miles of a power plant, and 39 percent of those living within three miles of a coal plant are people of color. That’s an uncomfortable truth Scott Pruitt and the Trump administration would clearly rather not face. After all, Pruitt is also dismantling the EPA’s environmental justice program designed to listen to and help those communities. Pruitt’s words and actions already led Mustafa Ali, the former head of the environmental justice office, to resign. So, what we’re left today is a sham hearing with a diverse set of voices arguing to keep the Clean Power Plan, and a coterie of old white dudes from the energy industry arguing to kill it. We already know how this will end. But, if you want to watch it go down, the West Virginia legislature is livestreaming it.